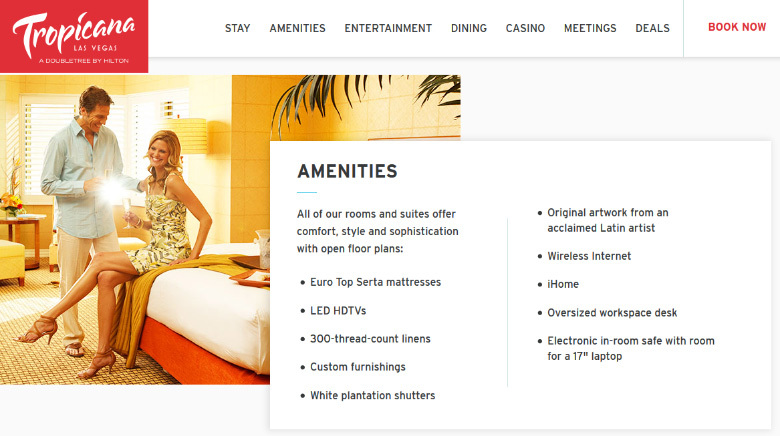 NamesCon 2018 : Tropicana Las Vegas offers a Cyber Monday $39 special rate! :DomainGang NamesCon 2018 : Tropicana Las Vegas offers a Cyber Monday $39 special rate! NamesCon 2018 is coming up in January, and the Cyber Monday deals are getting bigger. Not only is NamesCon offering 50% off its regular ticket price today only, Tropicana Las Vegas – the conference’s venue – is dropping room prices to as low as $39 dollars per night. A couple of caveats: the discount offer codes can only be applied when calling in to make a reservation, apparently, and the rate does not include a $33 dollar /night resort fee. Still, that’s cheaper than any regular booking rate we’ve seen at the Tropicana Las Vegas, which normally begins at around $110 dollars /night. To take advantage of the Tropicana Las Vegas $39 dollar deal, click here. For your convenience, the hotel’s reservation number is 1.800.545.4989. I just called about this deal since i havent reserved my room yet. This deal is over for the dates of NamesCon. The only dates left that have this $39 special are Dec. 17th thru Dec.22nd.